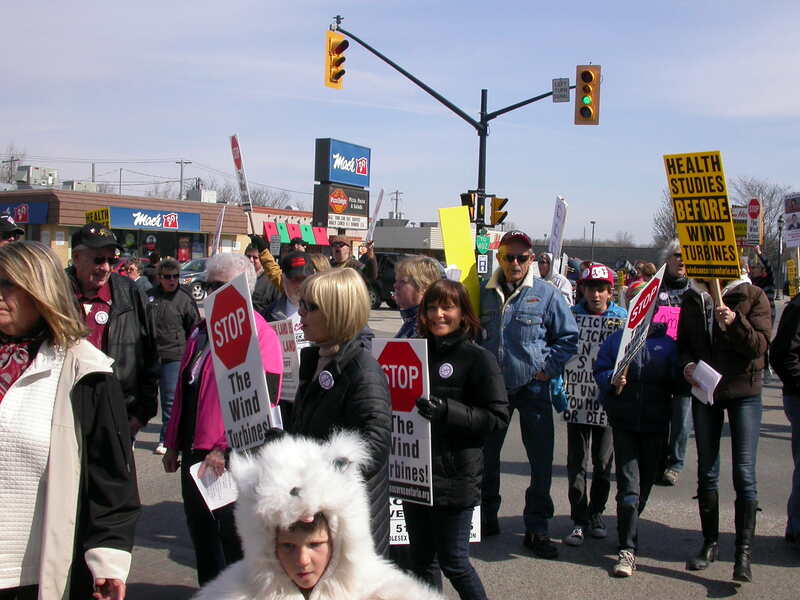 STRATHROY — A peaceful march down a typical smalltown main street erupted into an angry confrontation Saturday that spells continuing trouble over Ontario’s green energy plan. 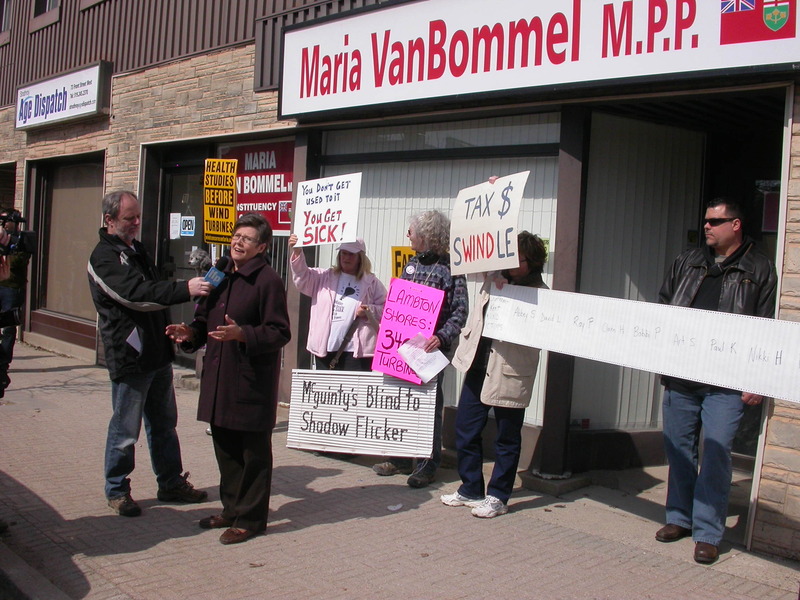 About 80 protesters, many shouting, some in tears, repeatedly drowned out beleagured Liberal MPP Maria Van Bommel as she tried to defend her government’s wind turbine policy. No matter what the Lambton-Kent-Middlesex MPP tried to say, protesters cut her short, demanding she work to stop construction of wind turbines until independent research proves they’re safe. “I am really pleased to see all of you. I think certainly the sun and weather is helping out a great deal,” Van Bommel said when she saw the crowd. “It’s passion, passion!” a protester yelled. “The truth brings us out,” another shouted. Even when Van Bommel engaged protesters one on one, she got an earful. Stephana Johnston, 81, told Van Bommel she lives on the north shore of Lake Erie and has been forced out of her home because turbulence from dozens of nearby turbines are affecting her sleep and health. “We are suffering and it is a horror and you are responsible because you agreed to the Green Energy Act,” Johnston said. Chanting “McGuinty must go!” and “We’re not your guinea pigs,” protesters marched 550 metres from a plaza to Van Bommel’s office, the closest a wind turbine can be built to a home. Opponents say turbines emit low-pitched sounds that disrupt the body’s rhythms and cause headaches, tinnitus, dizziness, nausea, rapid heart rate irritability and problems with concentration and memory. Van Bommel’s riding has more than 500 wind turbines in the works, said protest organizer Esther Wrightman of the Middlesex Wind Action Group. After the hour-long, heated debate outside her office, Van Bommel said she undertands the anger. 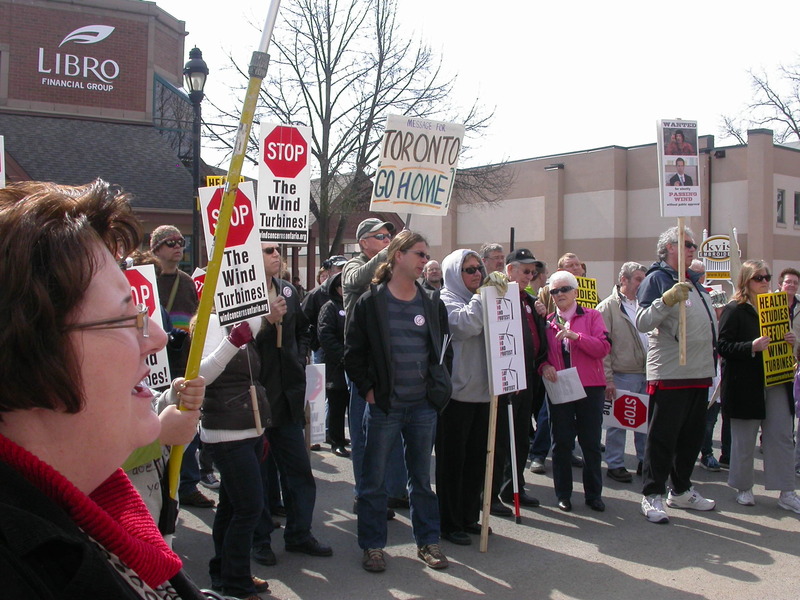 Van Bommel said she’d keep a promise made to protesters to take their concerns to her Liberal caucus. With the next Ontario election only five months away, wind energy — opposition by many to the growth of wind farms, vs. proponents who believe it’s a good way to help replace dirty coal-fired power — is on track to become a huge issue. Wind farms have been proposed in many areas of Southwestern Ontario, a 10-riding region dominated by McGuinty’s Liberals in the last election four years ago. E-mail randy.richmond@sunmedia.ca, or follow Randyatlfpress on Twitter. Posted on April 3, 2011, in Green Energy Act, Health, London Free Press, Ministry of Environment, Take Action. Bookmark the permalink. Leave a comment.